The CSM Course is a 2 day class from 9AM-5PM, a light breakfast is served at 8:30AM and Lunch is provided mid-day. There is no required prior certificate, educational background, or work experience needed to participate in the CSM course, complete the exam, and receive certification.The Certified Scrum Master course is designed to introduce you to the basics of Scrum, and as such all backgrounds are welcome to join and achieve Scrum Master Certification. In order to take the CSM exam, each student must attend no less than 15 hours of the 16 hour class. 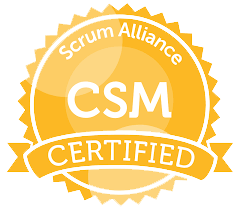 The CSM exam is administered online and sent via email after attendance is recorded and reported by your Scrum Alliance Instructor. The link is sent 24-48 hours after class concludes. You have 90 day access to take the exam and 2 attempts towards passing. The exam is 50 questions in multiple choice format. Upon starting the exam you have 60 minutes to complete it. By attending the 2 day CSM course you will earn 16 PDU/SEU that can be applied towards further educational goals. To claim credits a code is provided at the end of the CSM course book.